Imagine an impossibly narrow canyon with sinewy curved and twisted wind-swept paths, lit with mysterious shadows and hints of light, that tempt canyoneers to wiggle, slither and climb to its finish. Add to that a fun 4WD right to the slot canyon entrance and you have Red Cave. Lower Red Cave fills and empties with sand making the slot change rapidly from an easy hike through with simple bouldering to a tough slot with lots of bouldering. Its impossible to know the conditions you will find on any visit. Upper Red Canyon is a canyoneers dream. A narrow, long slot filled with ice cold water and numerous down climbs or short rappels. Distance: Upper Red Cave: : Upper Red Cave is 1.8 miles from Highway 89 and Tait Lane in Mt. Carmel. Lower Red Cave is 3.5 miles from Highway 89 and Tait Lane in Mt. Carmel. Average Hiking Time: Varies, depending on your plans. A round-trip to just Upper Red Cave and back- 2 Hours; Exploring Upper Red Cave, add 2 hours: A round-trip to just Lower Red Cave and back- 4 Hours; Exploring Lower Red Cave, add 2 hours. Doing the loop hike by going up Lower Red Cave and crossing overland and descending Upper Red Cave and back- 7-8 hours. Equipment: 80' rope, webbing, harness and rappel device, map, dry bag and possibly a wetsuit for Upper Red Cave. Difficulty: Down climbing and rope skills are needed. Exposed slickrock scrambling and traversing. Route finding skills necessary for loop hike. Trailhead: Tait Lane in Mt Carmel, 2 miles north of Mt. Carmel Junction on Highway 89. .2 Miles north of the historic schoolhouse in Mt. Carmel. If hiking in, then park at the Old Rock Church and walk to the trailhead. Do not park at Tait's gate on Tait Lane. If you ask Del Tail really nice, he will probably let you drive to the mouth of the slot. Hazards: Hiking in slot canyons presents a very real danger from flash flooding. Do not hike this trail if it is raining. Remember a storm far off can trigger a flash flood. Rocks in the streambed can be loose and dangerous footing. During summer months temperatures are hot and dehydration is very possible. Carry at least 3 quarts of water per person in summer. Written permission has to be obtained from the Del Tait family since you will be crossing their private property. This is a very nice family and they are happy to let you pass if you will call or stop by their house. It is in Mt. Carmel and it is located directly across the road from Tait Lane, so it's easy to stop by. Call before going so you can make sure someone will be home to give you a written note. Red Cave is a treasure among the slot canyons of Utah. Bo Beck stays far above the high water and debris of the canyon floor. Upper Red Cave (North Fork of Sand Wash) - If you are walking, then hike from the Old Rock Church, where you parked, to Tait Lane. Weather walking or driving, turn east on Tait Lane going .1 miles and cross the East Fork of the Virgin River. The road then will swing north then back east and ends at a gate after another .1 miles. Open the gate and walk through closing the gate after entering. Be sure to do this so Tait's animals do not get out. Immediately turn left and skirt alongside the barn and corral as you walk northerly. Soon the road will come to a "y" and it will be necessary to stay right. Just another 20 yards further the road splits again; Stay right again as the road will now ascend the hillside. After .25 miles of ascent the road begins to level as it takes a turn to the south-east and cuts through the juniper and pinion forest and soon passes through a fence. The trail begins a mild ascent again and at 1.2 miles of walking arrives at the north rim of the plateau looking south and far below is Upper Sand Wash. The road becomes somewhat steep in its 250' vertical descent to arrive at the bottom after just .25 miles. At this point a decision is made to turn right to access the junction of Upper and Lower Sand Washes (heading for Lower Red Cave) or to turn left to access Upper Red Cave. Upper Red Cave is just a short .4 mile walk up the sandy drainage. If the decision is made to go to Lower Red Cave instead then walk downstream for 1.25 miles to the junction of Upper and Lower Sand Washes, and then walk up (east) Lower Sand Wash for another 1.25 miles to arrive at Lower Red Cave. Just a short way in, is usually some cold water, but it is possible to take a peek of what's waiting ahead. The easiest method of entry is to leave the slot and follow the faint wash to the northwest of the entrance (on the left when facing the slot canyon), up toward the base of the cliff, and scramble along the base of the cliff in a northerly direction until topping out on a ridge. Then, turn to an easterly (to your right) direction and follow the easiest path of travel, climbing the ridge, dropping into a slickrock bowl, then climbing out of the backside of the bowl. Always keep the slot canyon to the right side (south) in sight. Once topped out on the ridge you've been traveling on, begin to bear to the right even more, (south-easterly) and find the easiest path to the bottom of the Upper Red Cave Wash, now an open wash below. Once you have accomplished the tenuous route finding, down climb into the open wash below, you may start your journey to the east (your left at the bottom of the wash). Enjoy as the wash narrows, and then opens once again numerous times, always leaving you wondering what may present itself around the next bend. After dropping into the slot, take the time to hike up to the top of the slot canyon before dropping into the wet, narrow, technical section. This upper, dry part is worth the time to explore. There are narrow, photogenic sections with enough light to get some great photos and the jaunt will warm the body in preparation of the cold water section below. There are a couple of sections where it is possible to stem and boulder as well, but keep going until reaching a dead end even though the slot will open up at times. This is a nice spot for lunch. After hitting the dead end, head back down the slot toward the entrance. Technical Section - Climb down into the technical section, making sure all sensitive gear is safe in dry bags. In the summer there should be no need for wetsuits, but it does get chilly and dark in this section. This is the part of Red Cave that most canyoneers come for. It is narrow, long, gorgeous, challenging and wet. There are numerous down climbs, stemming, bouldering and a few places where a rope might be needed. Most canyoneers should be able to down climb the obstacles, but do bring a rope! This canyon changes dramatically in short periods of time. Photographers dress warm and plan to stay a while. A tripod would be handy in here even though all the photos in these albums are taken without one. Lower Red Cave (south fork) - Once entering Lower Red Cave t he winding slot walls are gorgeous, but immediately there is an impassible 15' obstacle. Periodically locals will hang a rope from the dry fall that can be climbed, but be wary since this rope becomes tattered and torn through years of flash floods and exposure until it eventually washes away. If able (and perhaps foolish enough) to climb the remnants of the rope, there is another impossible obstacle above. Again the locals will Band-Aid the problem, by putting a ladder in this location. The ladder however tends to wash away more often than the rope. To be on the safe side, leave the slot canyon and hike up the hillside (to the south), dropping back to the slot when it opens up, bypassing these two obstacles. Once in the slot be sure to hike back and look down into the chamber that was not accessible. There should be a huge chokestone situated above. This fork of the slot is usually dry and often is easy to walk. Depending on if the last flash flood laid down sand or washed it way it can be a difficult canyon or an easy one. There are many boulders in the path and if the canyon floor is washed away it's a difficult climb up and over the rocks. The canyon walls immediately narrow and are splashed with rusty colored "paint." Twisting caverns let light peek in from the top throughout the hike. Moss covered walls, high up on the sandstone, will hint at the water levels present at times. Midway in the hike is a charming window. Just a few years ago that big hole was only the size of a softball. Now that's erosion! The canyon looks like it ends here as it opens up, but continue forward. More narrows sections are ahead. When the slot comes to an obvious end, backtrack and return to the entrance. Choose to rappel down the two obstacles that were at the entrance to the slot canyon or again hike around and out. After returning to the entrance of Lower Red Cave hike back to the junction of Upper and Lower Sand Washes, then follow Upper Sand Wash to the exit road leading back to Tait Lane. This hike of 8.5 miles round trip includes the best of the best and can be done in a day easily, but will be a strenuous undertaking! This hike combines 2 classic slot canyons by hiking the entire loop. Hike up to the lower fork of Red Cave, entering the slot near the mouth and then hiking cross country, dropping into the upper fork of Red Cave and exiting at the upper fork cave entrance. The directions below explore each fork of Red Cave separately. Lower Red Cave - Walk into the ever-constricting canyon to the east. Soon travel is thwarted by a steep slickrock slide in the narrow slot canyon. Some may want to scramble up this slide however just a short distance beyond is a 20' high vertical chimney that would turn around all but the best climber. Walk back out of the Cave and look for the steep slope on the left as exiting the canyon. There is an eroded path that ascends steeply 250' in a southerly direction and then will begin traversing left (up canyon). Follow the path for several hundred yards staying relatively close to the slot canyon, and soon the trail will descend toward the canyon below by traversing upstream and eventually coming to a slab of slickrock that can be carefully down climbed. An 80' piece of rope can be used as a handline to assist on the steep grade of the slickrock. Be sure to travel back down the canyon to view the 20' chimney that was avoided by climbing up and around. Now walk up canyon as it opens and closes and presents challenging boulder obstacles to overcome for the next .25 miles. Cross Country Trek - The canyon opens up and presents a hillside and buttress on the left. Pick the easiest route to follow up the slickrock and soon notice the double window in the rock formation above . Travel up and toward the windows but passing the buttress on its right side. Travel continues northerly up a ridge and a larger summit appears on the right. Travel north keeping the larger round summit to the right. By contouring (staying at the same elevation), travel will pass by some small washes and soon a large wash will appear in front. Contour this large wash by steering right and around its head, and then begin traveling up and north easterly from the head of the wash. Just a short distance after arriving at the top of the plateau, an ATV road will be crossed and followed for a very short time. From the ATV road travel north and soon a wash will form and descend into the head of a major drainage. Work down the steep slickrock very carefully to arrive at the bottom of this major drainage filled with many desert tanks. Walk north in this charming drainage .4 miles until it dumps into Upper Red Cave. Upper Red Cave - At this point an anchor could be constructed for a 25' rappel or simply walk north up the ridge and then back down the north side of the same ridge to arrive in Red Cave. Beware: It is a steep and slippery traversing descent into Red Cave. Once in Upper Red Cave, travel now becomes a chorus of down climbs (up to 8-10') into pools that may be filled with water/ mud and into the depths of the eroded sandstone. The next .4 miles offer some of the best Slot Canyoneering to be found! The exit from Upper Red Cave is from a very dark narrow slot canyon into an immediately wide open, sunlit sand wash. Walk down Upper Sand Wash to the exit road back to Tait Lane. This description includes information to arrive at either Upper or Lower Red Cave as well as a loop hike that includes both. Access to these beautiful gems, located on BLM lands, at one time was permitted by 4WD, but sensitive private land ownership concerns has temporarily put a halt to motorized vehicle access. This concern is being addressed by Kane County and may take some time to resolve. Fortunately easy access by foot still exists. Rappelling and climbing skills are required to navigate through this slot canyon. Remember slot canyons can change dramatically in a short time due to flash floods and water levels in this canyon change. These directions are only a general reference. Be prepared for variations in the canyon. Technical Canyoneering: Never enter a semi-technical or technical canyon without the knowledge and skills needed to safely explore and return. Many technical canyons also require GPS skills or excellent map reading skills to navigate. 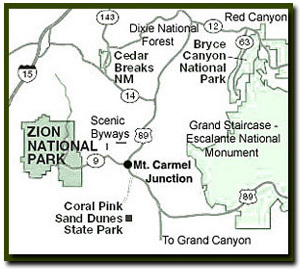 Beta: Coordinates and other trail and canyoneering information by Zion Park search and rescue veteran team member Bo Beck and www.zionnational-park.com author, Tanya Milligan. Suggested Gear: Rope, webbing, harness and rappelling device. A sturdy pair of shoes are recommend for canyoneering in Zion . Quality shoes will help grip the rocks and prevent injury. Experienced Zion hikers and canyoneers like the Sportiva Exum Ridge. This shoe is great for hiking, bouldering and canyoneering.